We’ve had a lot of milestones this year with our teaching. We’ve delivered over 14 workshops and diploma courses this year plus dozens of 1 to 1 sessions. 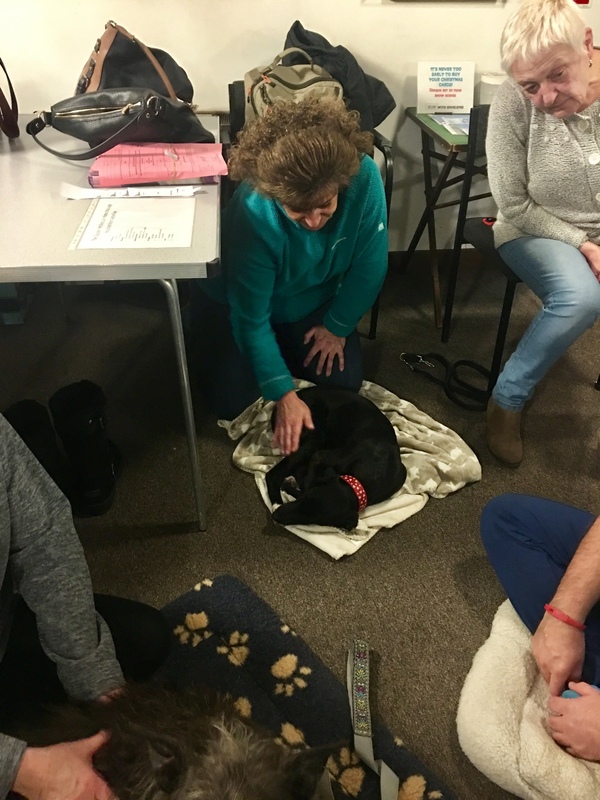 Thanks to Paws, Play & Stay for hosting many of those classes and Elizabeth Whiter with the Healing Animals Organisation for the Diploma courses. That’s a heck of a lot of dog Mums and Dads in East & West Sussex (plus others who came from London and beyond) who understand what is going on under their dog’s fur and now have the skills to help maintain their health and well-being. We also had a diploma module with the most dogs attending ever – 19 in 2 days. And yesterday ended our teaching year with the biggest workshop of 2017 – 18 people attending. We were invited by the Sussex Pet Rescue (http://sussexpetrescue.org/) to organise and deliver a workshop for their dog rescuers, fosterers, board members and even the founder of the SPR, Marcia Harris, who set up the organisation 50 years ago. The numbers who were interested, grew over the weeks and we filled up the hall. First time we’ve needed chairs in two rows too! Dogs of all ages, from a newly rescued anxious puppy to senior dogs came along. All sizes and breeds. All levels of anxiety from very nervous to very chilled. 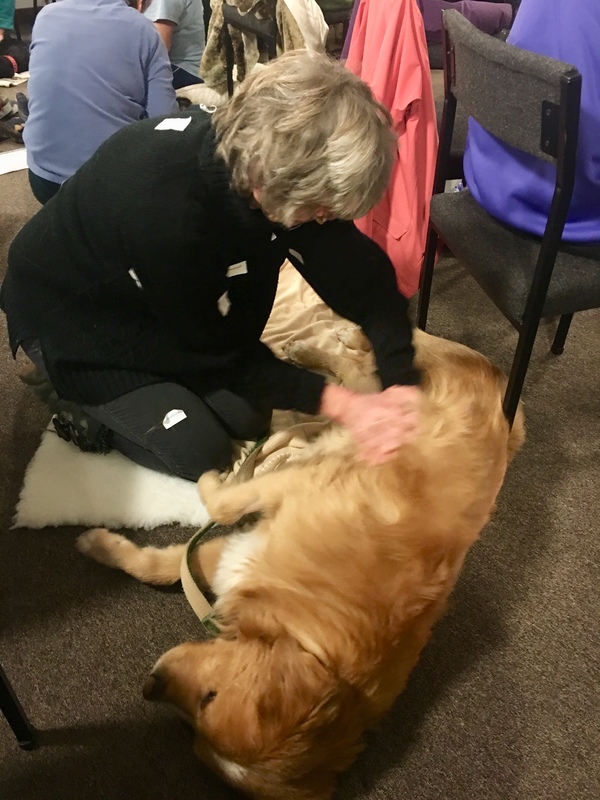 The group started off with a ‘getting to know what’s under the fur’ session so that people could identify and pick up on any issues quicker rather than letting potential mobility problems become chronic and long-term. There was no fancy technology this time just a white board and pens. The pages quickly filled up with benefits of massage showing how this therapy can be used for so many different conditions and uses. Canine massage is truly multi-therapeutic and not for a single purpose only. We had dogs who needed help with their mobility due to their age or surgery. We had dogs who had been newly rescued and were quite anxious – although the littlest fella in the group decided that falling asleep on his foster Mums massage mat was far better than being nervous. We had dogs that needed a bit of stretching and myofascial release to ease out aches and strains. And we had dogs who just enjoyed it. 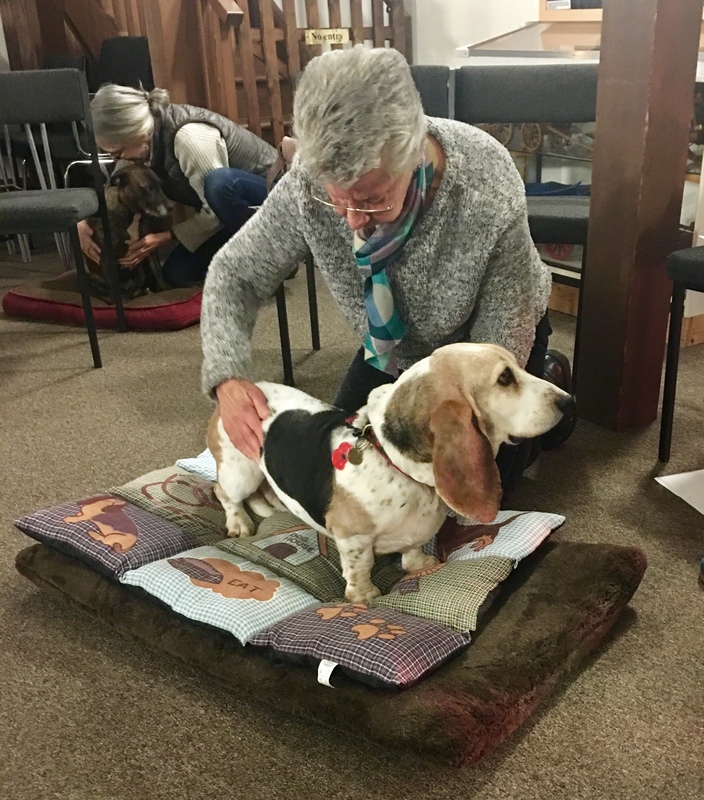 We’d devised a special routine for the Sussex Pet Rescue comprising 13 massage techniques and the workshop finished with some Canine Pilates stretching the dogs out before their trips home. Thank you Sussex Pet Rescue, we’re looking forward to coming back to show more of your members how to help your lovely rescued dogs. This entry was posted in acheypaw, achy paws, AchyPaw, achypaw myotherapy, Brighton Dog Massage, canine arthritis management, canine myotherapy, canine myotherapy, dog myotherapy, achypaw myotherapy, myotherapy, achy paws, classes, Dog, Dog massage, dog massage classes, dog myotherapy, Dog shows, massage benefits, multimodal, multimodal therapy for dogs, south coast dog massage, south coast myotherapy, Sussex Pet Rescue, therapeutic massage, training and tagged achypaw, achypaw myotherapy, achypaws, arthritis management, Brighton, Canine massage, canine myotherapy, Dog massage, dog massage classes, dog massage courses, east sussex, one to one training, south coast, south coast dog massage, south coast myotherapy, therapeutic massage, www.achypaws.com. Bookmark the permalink.